Few disagree that HANS (Head and Neck Support) is one of the most sensible safety advances of recent years. So why hasn't a single F1 diver actually raced it yet? Everyone who has tried the HANS device, or even looked at it, can see its merit. Anything that prevents a driver's head being thrown far enough forward in a serious frontal accident to make contact with the dashboard has to be a good idea. In the CART FedEx ChampCar series in America virtually all of the drivers wear the device without a second thought. So why is it that at a time when Mika Salo, Heinz-Harald Frentzen, Eddie Irvine and Nick Heidfeld have all had accidents in which they have suffered headache-inducing head injuries this year, nobody in F1 has used it so far. Is it time that it was made mandatory, as per the FIA's original plan? This is what world champions Mika Hakkinen and Michael Schumacher think. 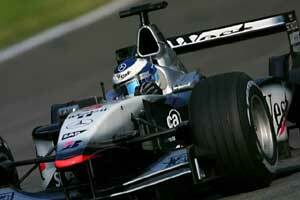 Hakkinen:"Whenever I've used it, and I've tried it a couple of times, I didn't have a big problem with it. But you definitely do have to personalize it, because of how it holds your neck and shoulders in one position. It's not very pleasant to wear, but I'm sure it's very safe. "I suppose I'm one of the best people to talk about that [after his heavy accident at Adelaide in 1995], and if they said that the rule was we had to wear it in one month's time, I think that would be absolutely fantastic. But what I don't fully understand is that if the system doesn't fit your shoulders 100 percent, does that mean it could be dangerous? That's what I don't know. If it wasn't okay, then I'd say we don't need it. But even if it was uncomfortable and you have a big shunt and it saves your life, that lack of comfort doesn't matter. It's not as if there isn't room physically for it inside the car." Schumacher:"There is no reason not to have the device. But it's still a bit far away. You have to make quite a big effort to adapt to it, because of course one design won't fit all 22 drivers. It's quite a solid piece of equipment, and it can be uncomfortable. You need to be able to move around a little in the car, so it's not quite there yet." Speculation in the paddock suggests that the FIA may move to make the device mandatory in the not too distant future, just to speed up development of individual interpretations of the design.